Hammered coins are produced by hand. This webpage is intended as a catalogue and image library of Irish ‘hammered’ coins, dating from the Hiberno-Norse series to those issued at the time of King Charles I in the mid-17th century. 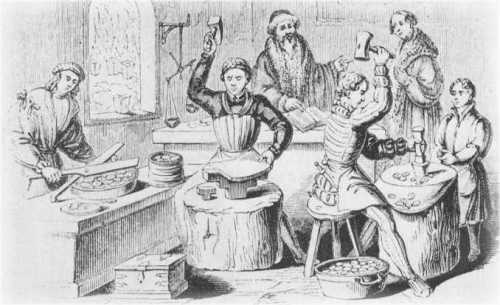 A typical scene at a late medieval mint. The man in the middle is ‘hammering’ designs on to blank pieces of silver or gold. This manual process, known as hammered coinage, proceeded under the management of a moneyer; it was the major method of coinmaking from 640 bc until as late as 1662. A moneyer typically kept one of every 16 pieces as his pay, so there is little wonder as to why they rejected the introduction of any mechanical means of coin making until the mid-1600’s. By way of illustrating what we buy and sell, please link to our Pinterest image pages and/or read the relevant blog posts on Irish numismatic and exonumia topics. This website is updated on a frequent basis, so do please ‘re-visit’ as often as you can. Please note: this is a constant “work in progress” and I will be adding more links + more images on an on-going basis. Collectors are quite welcome to send me images of coins that I do not already have, or better images of the one’s I have posted. Where possible, a simplified chronological order has been applied to coins minted in Ireland, minted elsewhere but intended for circulation in Ireland, or (in the instance of the earliest coins) those found in Ireland as a result of trading, gifts, votive offerings, or other forms of transaction. The Kingdom of Lydia existed from about 1200 BC to 546 BC. Coins are said to have been invented in Lydia around the 7th century BC. According to Herodotus, the Lydians were the first people to use gold and silver coins and the first to establish retail shops in permanent locations – their coins were an naturally-occurring alloy of gold and silver, now known as white gold – but called ‘electrum’ by the Ancient Greeks. The first coins to be used for retailing on a large-scale basis were likely small silver fractions, Hemiobol, an Ancient Greek coinage minted by the Ionian Greeks in the late sixth century BCE. Eventually, most of the Greek Empire used coins as a means of payment for goods and/or services. The Romans and Celts, in turn copied the Greek coins and gradually imposed their own cultural and commercial inputs to coin design. Blog Post – What is Celtic Ring Money ? Blog Post – Why have no Celtic coins been found in Ireland ? Trade decayed catastrophically in Western Europe after the fall of Rome. There was a catastrophic drop in urban populations, especially in regions that fell to illiterate successor states. Even in Italy, a large number of Roman towns disappeared after 300 AD, and many others went into deep crisis for several centuries. Rome probably lost 90% of its population in the 5th and 6th centuries. Hardly any new buildings were constructed anywhere in Italy, and even then the materials were recycled, not new. In the barbarian kingdoms that followed the Roman Empire, a poor copper-based coinage allowed small-scale transactions, but since the kingdoms had no civil service or bureaucracy, and no paid armies, any gold there was tended to accumulate in hoards (usually the king’s) that were used for major gifts, bribes, and purchases, but did not circulate readily. AD 431 Palladius went as bishop to ‘the Irish who believe in Christ’ lands in Wicklow. AD 432 St Patrick arrived to convert the kings. Conversion was slow, although St Patrick was not the only missionary. A Gaelic-Christian golden age was to follow. Western Europe became a region that neither used money nor had any (except in hoards along with other precious objects). Transactions and barter might still be denominated in money, but often the payment was in commodities. As in the Roman Empire, there was still an imbalance of trace with the East, and this drew gold out of Western Europe that never returned. The last of the barbarians to mint gold coins were the Lombards of Italy, who retained contact with the Byzantine Eastern Roman Empire during their struggle for strategic control of Italy. Only in Byzantine-controlled areas such as Sicily were gold coins still used for trade. By AD 500, monasticism made strides during this century, influenced by the British church. Monasteries were originally strict retreats from the world, but became wealthy and influential, bearing a rich literary and artistic culture. As time passed the monasteries grew into little cities with a variety of inhabitants. Provincial kings lived in some of them. Some monasteries owned huge tracts of land and were ruled by wealthy abbots. Town life revived only in the 7th century, but only in certain regions that acted as nuclei of trading networks and had retained or regained literacy: France, the Rhineland, and northern Italy. Even then, the political situation in northwest Europe was precarious. When the Arabs isolated northwest Europe, the Europeans had to become financially independent. From that point, trade in northwest Europe was based on a robust silver coinage, especially the denarius or penny, that was used for 500 years. Trade routes along the English Channel and North Sea coasts led to the growth of ports that were best placed to channel that trade. Dorestad, on the Rhine 20 km up river from the coast, had been the major city of the dukes of Frisia, then became an important trading center by 680 AD. Its importance increased greatly as it became the major port of the new Carolingian Empire that Charlemagne carved out from his power base on the lower Rhine. The silver denarius of the Rhine delta was minted by the millions, but its value always followed that of the Islamic dirhem that it imitated in style, size, and name. Much of the minting was done in Dorestad, especially after Charlemagne’s treaty with the Danes in 782, and his decision in 793 to increase the silver content of the denarius. Frisian traders shipped goods coming down the Meuse and the Rhine from Strasbourg, out of Dorestad all over the Rhine delta, westward along the French coast, eastward via coastal cities such as Emden and Hamburg (Hammaburg) to Denmark and into the Baltic, and northward along the coast of Britain as far as Northumbria. Dorestad exported pottery, glass, brooches, bronze goods, wine, and silver denarii in exchange for wool, furs, and slaves. This currency lasted over a thousand years as pounds, shilling, and pence, until it was abolished in 1971. 914 Large Viking Fleets arrive at Waterford. 976 Brian Boru, king of the Dal Cais, becoming a serious rival to the Uí Neílls. Supported by the Ostmen, he conquered Dublin and Leinster, and then the whole country. Blog Post: Why did the other Hiberno-Norse Towns Not Produce Their Own Coins? 1063 Harold and Tostig subdue Wales. The enigmatic O’Neil REX coin (Parsons, 1921) – is this the first native Irish coin ever struck in Ireland ? This coin was unique for almost a century but recently, another (similar) one has been found. Is this evidence that a native Irish king attempted to mint his own coins ? Were the native Irish also contemplating a currency, or were these coins for other purposes? O’Brien Rare Coin Review: Did a Gaelic king mint coins in 11th C Ireland ? 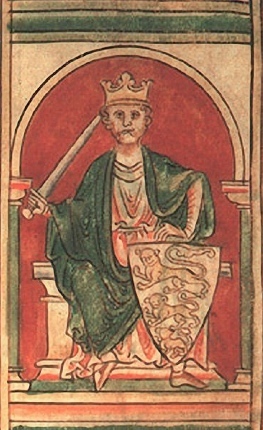 William the Conquerer famously invaded England in the year 1066 and thereafter set about replacing the old Anglo-Saxon (and Anglo-Norse) ruling class. The Normans didn’t colonise England, they merely took over the management of the country by installing new lords operating a European ‘feudal system’ of service and taxation. This took time to do and many local lords had to be defeated / removed before this process was complete. They didn’t, however, turn their attention to Ireland for over a hundred years. By the time Henry II arrived in 1172, the economic power of the Viking traders had waned and their coinage (not now traded internationally) had degraded to such an extent, that Ireland was a ‘coin-less’ country more or less self-sufficient with few imports/exports and ripe for economic development – provided they could take it and control it ! 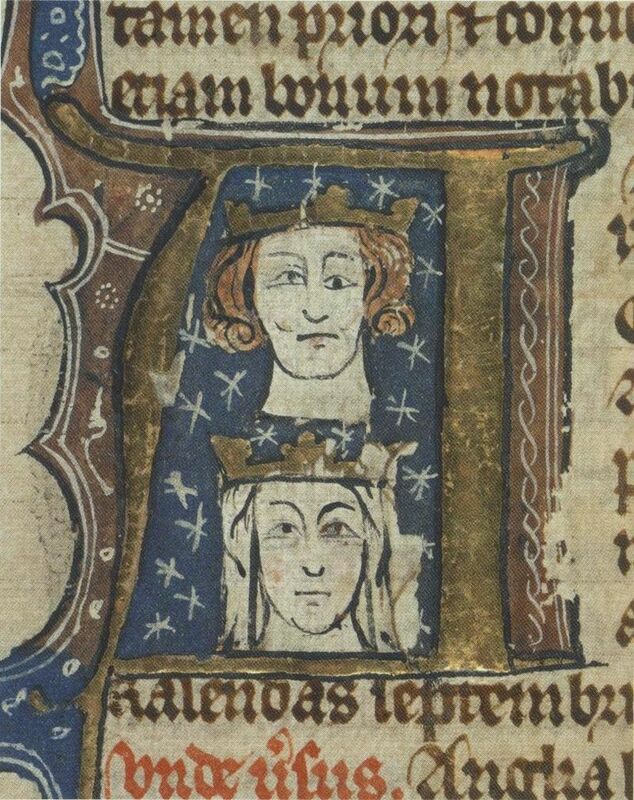 Henry II led an expedition to Ireland in 1172 and five years later he gave the title of Lord of Ireland to his son, Prince John, who introduced a new coinage for Ireland in his own name – not of his father. Shortly afterwards, a Norman lord (John de Courcy) dared to issue his own. This was the first in a long lineage of Anglo-Norman coinage for Ireland. 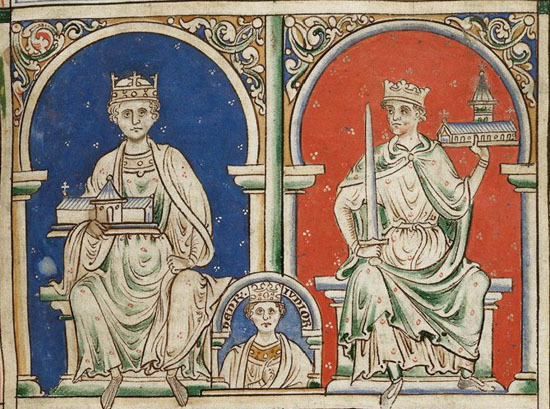 Henry II is shown above left, Henry the Younger is shown center bottom, and Richard I, the Lionheart, is on the right. 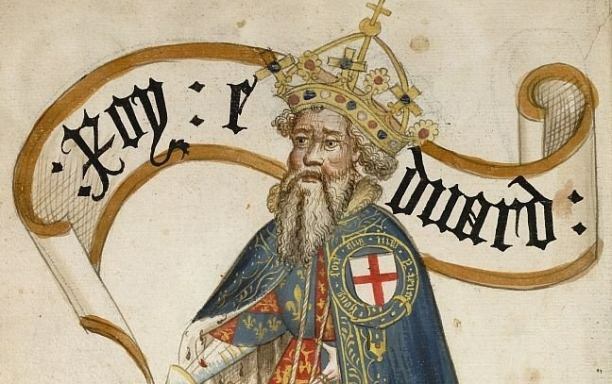 After almost 20 years of civil war in England, including rebellions in Wales and Scottish invasions, Henry II inherited a desolate land and began the long period of reconstruction in England. 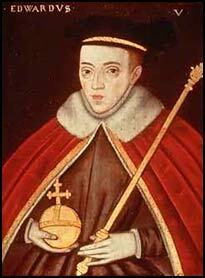 Henry was also known as Henry Curtmantle (French: Court-manteau), Henry FitzEmpress or Henry Plantagenet. He ruled as Count of Anjou, Duke of Normandy, and as King of England (1154–1189) and, at various times, controlled parts of Wales, Scotland, eastern Ireland, and most of western France. This was known as the Angevin Empire but Henry did not attempt to unify the coinages of his scattered dominions, preferring to allow the issue of local coins. Henry II issued no coins in Ireland under his own name but his son (John, Lord of Ireland) and his lord deputy (John de Courcy) each issued coinages. Like his father (Henry II) before him, Richard I did not attempt to unify the coinages of his scattered dominions of the Angevin Empire but continued to allow the issue of local coins. Richard I issued no coins in Ireland under his own name but his brother (John, Lord of Ireland) and his lord deputy (John de Courcy) each issued coinages. Louis VIII of France briefly ruled about half of England from 1216 to 1217 at the conclusion of the First Barons’ War against King John. On marching into London he was openly received by the rebel barons and citizens of London and proclaimed (though not crowned) king at St Paul’s Cathedral. Many nobles, including Alexander II of Scotland for his English possessions, gathered to give homage to him. 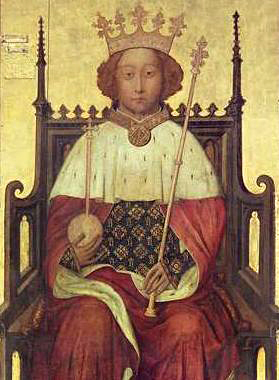 King Henry III of England, c. 1350-1400. 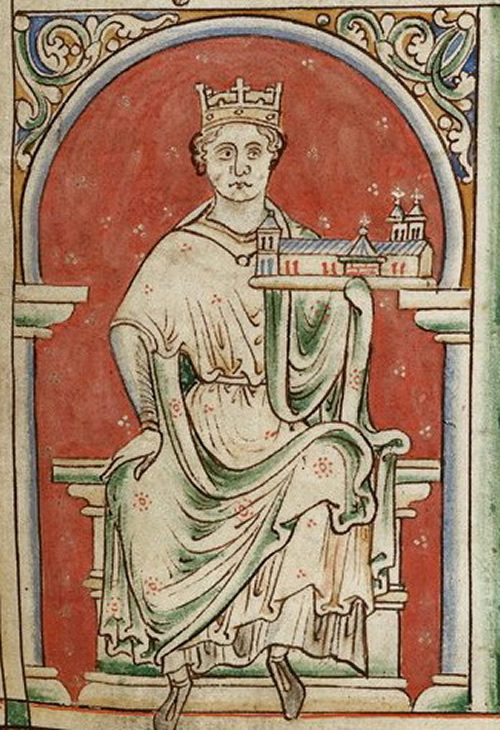 A page of illustrated Latin text showing King Henry III holding out his arm on which he carries a garment. From the Chronicle of St.Albans by Thomas Walsingham. 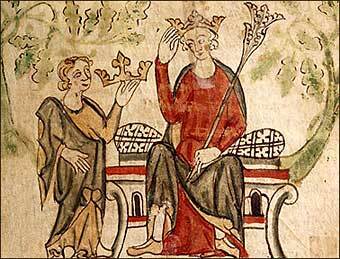 King Edward II of England was one of history’s least loved monarchs. 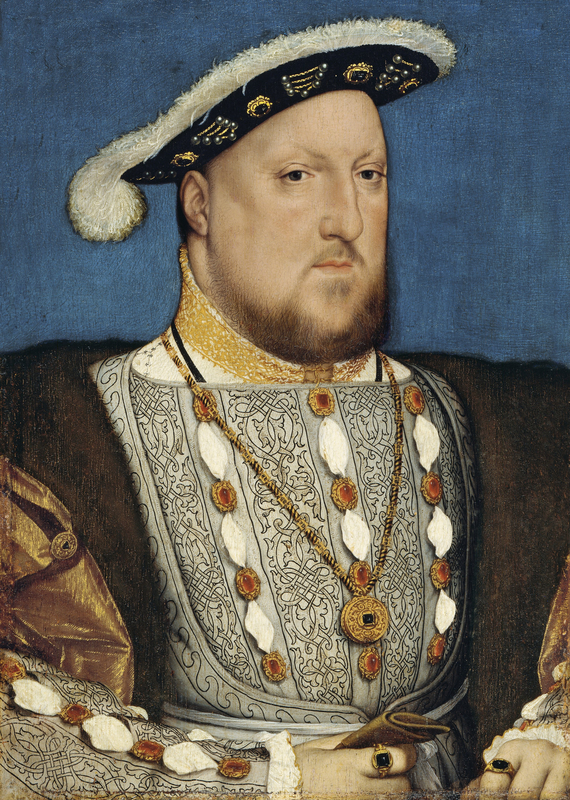 From the day he took up rule of his nation in 1307 he was controversial due to his strong attachment to a series of court favourites, believed by most to be his lovers. He was also unfortunate in the wars against Scotland, which his father Edward I, ‘Longshanks’ or ‘The Hammer of the Scots’, had started with great success. 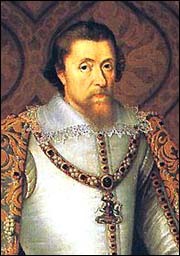 During his reign not only did the Scots reclaim most of their country from English rule, but a number of civil wars broke out when English Barons rebelled with the purpose of eliminating Edward’s favourites. 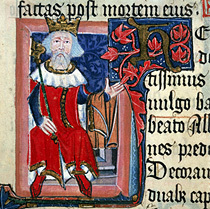 A medieval miniature of Edward III of England. The king is wearing a blue garter, of the Order of the Garter, over his plate armour. 1327 Almost half of colonised land in Ireland belonged to absentees and the resident Anglo-Irish nobility accused them of endangering the colonies through neglect. 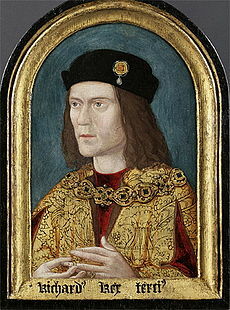 Following the death in 1376 of his father, Edward of Woodstock (the Black Prince), Richard became heir to his grandfather, King Edward III of England, whom he succeeded in 1377 at the age of ten. Blog Post – Monetary Crisis (1369), as Richard II orders his colonists in to search for new silver and gold mines in Ireland. 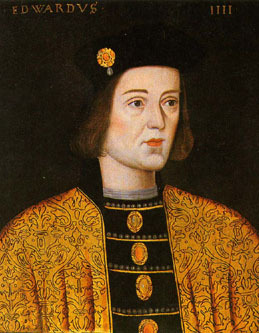 His reign of twenty-two years saw a number of domestic crises, from the Peasants’ Revolt (1381) to later conflicts with a disaffected nobility, culminating in his usurpation by his cousin, Henry Bolingbroke (crowned Henry IV). 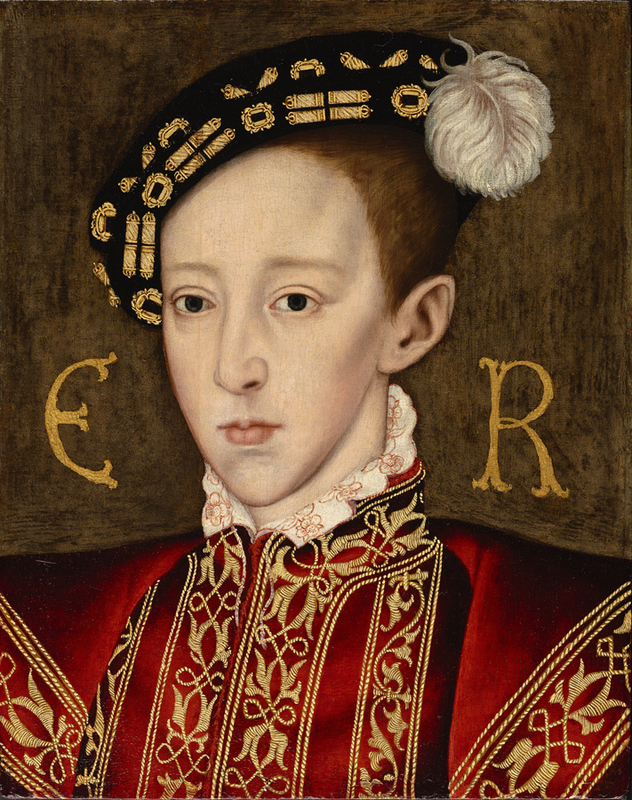 The so-called Wars of the Roses was an ‘extended’ civil war over the throne of England fought among the descendants of King Edward III through his five surviving adult sons. Each branch of the family had competing claims through seniority, legitimacy, and/or the gender of their ancestors. 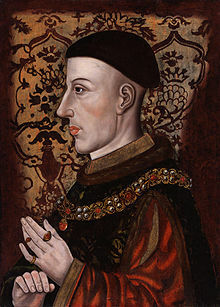 Henry VI was King of England from 1422-1461 and again from 1470-1471, and disputed King of France from 1422-1453. 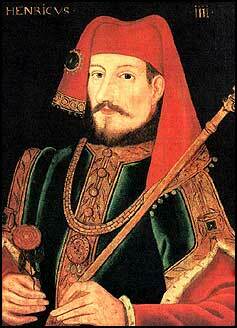 Until 1437, his realm was governed by regents. 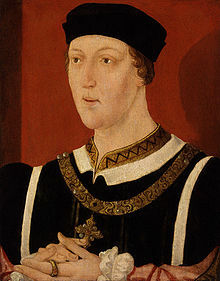 Henry VI’s reign over Ireland proved to be rather problematic from a monetary viewpoint and he made several proclamations re money supply, foreign exchange and the export of coin. The “Princes in the Tower” is an expression frequently used to refer to Edward V of England and Richard of Shrewsbury, Duke of York – the only sons of Edward IV of England and Elizabeth Woodville surviving at the time of their father’s death in 1483. Then 12 and 9 years old, they were lodged in the Tower of London by the man appointed to look after them, their uncle & Lord Protector: Richard, Duke of Gloucester. This was supposed to be in preparation for Edward’s coronation as king but Richard took the throne for himself and the boys mysteriously disappeared. 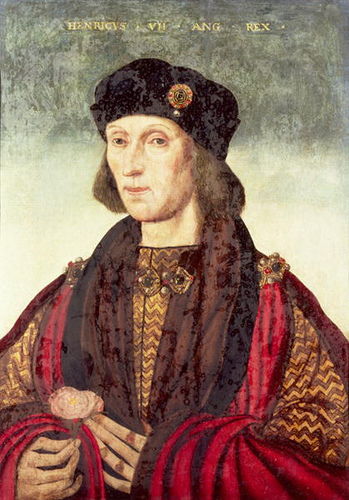 1491 Perkin Warbeck claimed to be Richard, Duke of York, having supposedly escaped to Flanders. 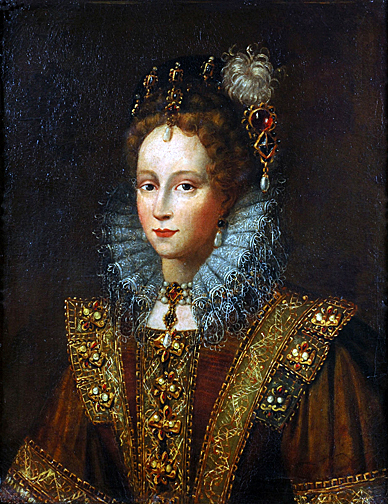 Mary did not believe that she should marry one of her own subjects. She thought that a good Christian wife should not be able to lord over her husband as she would be forced to do. 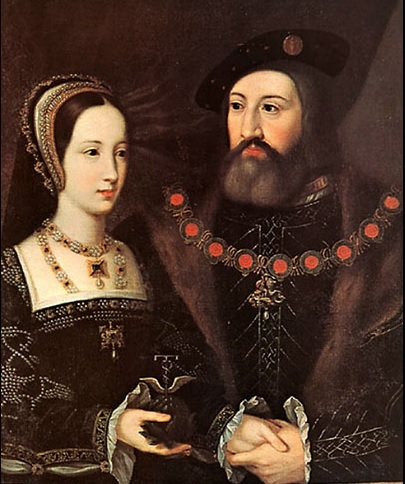 She would have to marry someone of equal status as her, and she would not allow him to rule over England. 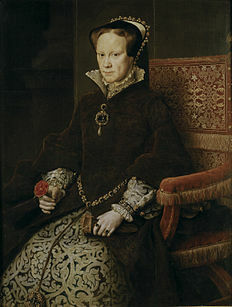 The person she chose was Philip II of Spain, who was the son of her cousin, Holy Roman Emperor Charles V. This has been seen as the defining mistake of her reign. The reign of James I (pictured above) was somewhat of a transition period in Irish numismatic history for he was the last English monarch to issue ‘hammered’ coins (produced by hand) for Ireland and also the first to issue ‘milled’ coins, i.e. manufactured by machine. His ‘milled’ coins were not intended to be used in Ireland but a later version of his ‘patent’ farthings were ‘authorised for use’ in Ireland – although they were struck for his son, Charles I, from 1622 onwards. If you found this website useful, please connect to me on LinkedIn and endorse some of my skills. This is a fantastic source of information. thank you!